I was very grateful and then impressed as I began to read some of Henry's poems. I used his Christmas poems on the back of our Sacrament Meeting programs for the holiday. I went back and showed those to my friend who had given me the book and she was pleased. It was easily determined that Henry Vaughan claimed descent from the same late medieval Vaughans that I did. Clue no. 1, would be his tomb covered with the ancient armorial symbol, the boys with the snakes around their necks (also seen in my new, personalized embossing above). 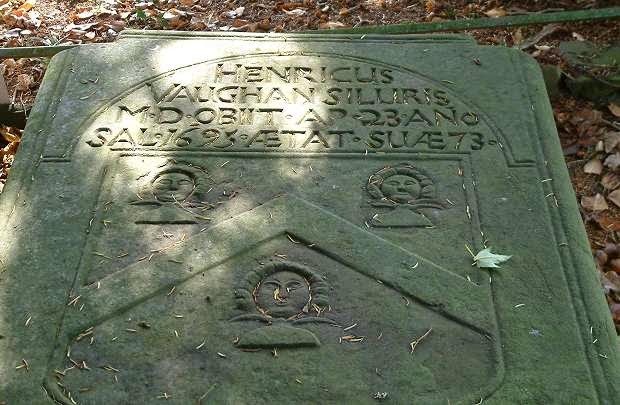 Henry's Grave at Llansantffraed on the Usk River below Brecon and above Abergavenny. Then, because of Elder Neil A. Anderson's message promoting family history "to find our cousins," I thought, "Hmm. Henry is somehow a cousin of mine, so let's figure it out." It was a bit tedious with occasional points of great interest as I worked down the lines of the Vaughans of Bredwardine, Hergest, and Tretower from the National Library of Wales, Dictionary of Welsh Biography. I worked through Ancestry.com and found some conforming documentation. 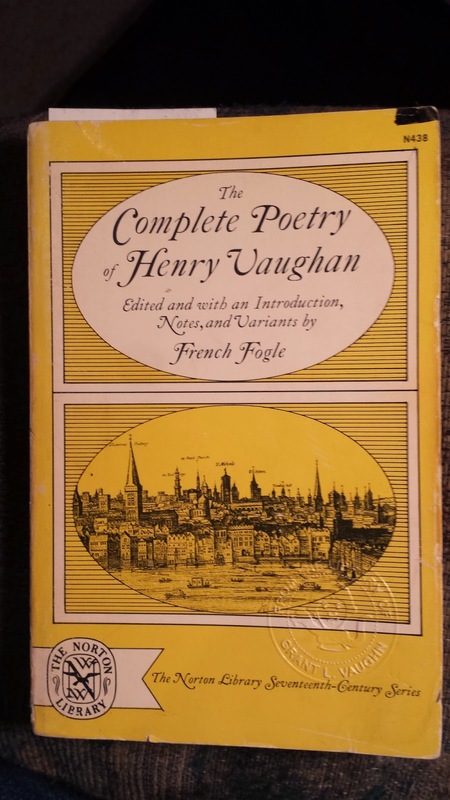 As I haven't yet traced my Vaughan surname back past 1732, but I do have another line through some matriarchal connections that take me back solidly to the Tretower Vaughans, I could work back down to Henry, the Poet, and find that I'm at least his 5th cousin, 12x removed. I may have a shorter connection, but it's not yet established. This may be a bit beyond what Elder Anderson was talking about, but, hey, it worked. Coming down to Henry's family of Llansantffraed Parish and their house at Newton near Scethrog (Newton being the estate and Scethrog - or Skethrog, the village), I also found all kinds of information about Henry's twin brother, Thomas. I knew about him as the Poet's twin and that he was an Alchemist more than a Poet. And what I found out blew my mind. In the 17th Century, the ancient art of alchemy was slowly turning into chemistry or pharmacy leaving behind the magical philosopher's stone of all knowledge and power (principally to turn base metals into gold). Sir Isaac Newton himself started as an Alchemist, then developed more scientific ways to explain gravity and basic laws of physics. Thomas was transitional as well with a very deep religious streak much like brother Henry and his poetry. And very uniquely, Thomas had a living Muse in his wife, Rebecca, who joined in his work as an equal partner - rather unusual for those days. 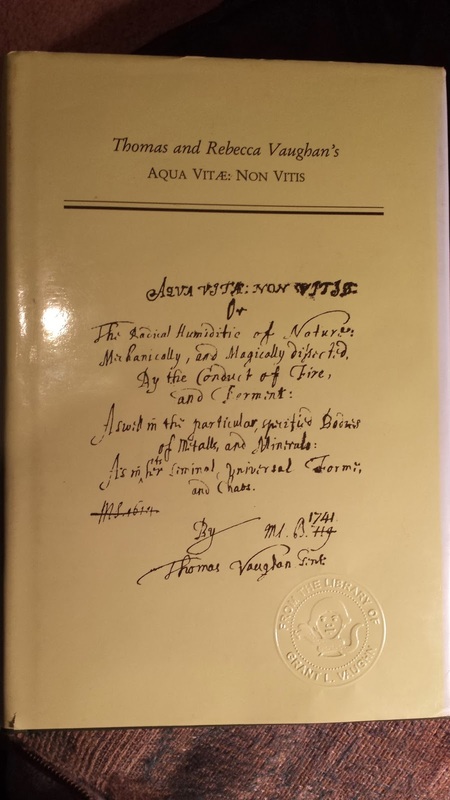 There was also the discovery of Thomas's books on alchemy, especially one favored by students and scholars of the 17th Century, Aqua Vitae: Non Vitis, [The Water of Life: the Vine] a rather unusual summary of Thomas and Rebecca's work written as a journal in Latin with a few biographical entries. That's what I needed for my family history work! (not so much for turning anything into gold, and hopefully with English translation). Thomas and Rebecca did accomplish one amazing metaphysical feat in developing a solid and loving relationship that seemed to last beyond the grave as Thomas recounts in dreams. Metaphysics in those days included the religious concept of a physical resurrection through Christ. One of the efforts of Alchemy (and that helped lead to modern Science) was the study of base elements to determine how the world was created - because by the same Holy Spirit that created or organized the elements, Alchemy sought for the aqua vitae - the living water that would quicken our dead bones into resurrection at the final judgment. The best they ever got for living water was apparently pure alcohol, along with a few other elixirs. And Indeed These Are, those secrets I found in minerals in the days of my dearest wife, whom my merciful God will grant that I see and speak with again in heaven. Amen, o Lord Jesus! Light and life of the world, Son of God, Son and Redeemer of Mankind! As God decreed so wee agreed. O Christ Jesus! Light and life of the world: Son of God, Son and Redeemer of Mankind: Draw me, after Thee: We shall run! Amen! In ye Evening I was surprised with a suddaine Heaviness of spirit, but without any manifest Cause whatsoever: but I thank god, a great Tenderness of Heart came along with it: soe that I prayed most earnestly with abundance of teares, and sorrow for sinn. I fervently solicited by gratious god for his pardon to my self, and my most deare Wife: and besought him to bring us together againe in his Heavenly Kingdom, and that hee would shew me his mercie, and answer my prayers by such meanes, and in such a way as might quicken my spirit, that I might serve him cheerefully, and with Joy prayse his name. I went that night to bed after earnest prayers, and teares, and towards the Day-Breake, or just upon it, I had this following dreame. I thought, that I was againe newly married to my deare Wife, and brought her along with mee to shew her to some of my friends, which I did in these words. Heere is a wife, which I have not chosen of my self, but my father* did choose her for mee, and asked mee, if I would not marry her, for shee was a beautifull Wife. Hee had no sooner shewed her to mee, but I was extremely in love with her, and I married her presently. When I had thus sayd, I thought, wee were both left alone, and calling her to mee, I tooke her into my Armes, and shee presently embraced mee, and kissed mee; nor had I in all this vision any sinnfull desyre, but such a Love to her, as I had to her very Soule in my prayers, to which this Dreame was an Answer. Hereupon I awakened presently, with exceeding great inward Joy. Blessed bee my God, Amen. Temple work has never been done for these dear people. Even if I'm only a 5th Cousin, 12x removed, I think I'd better do it! We run!